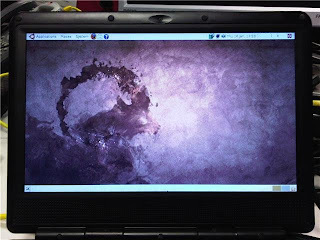 I got hold of an used old (2008) Elonex Webbook during my holidays with windowz install and as it was free I didn't complained and was really happy for it. Other Webcam, 3-in-1 memory card reader. 3 USB Ports. I never thought of having a netbook if I could get a laptop with all the toys but apart of getting used to the keyboard (full qwerty but rather small and keep pressing the wrong keys) I quite like it. The first week as I was away I used it with Windowz and was impressed for the response time. Will not support loading all the Adobe Premier collection but to walk around, sit on a coffee shop, park bench and surf the web, respond that last email, check the doc/xls file or chat is quite good. Once back home the first thing I do was upgrade the RAM to 1GB with a spare DIMM I had. Checking the web I found people trying to use 2GB but only 1 seems to be recognized. Second thing was install Ubuntu. I downloaded Ubuntu Network Remix 9.10 (UNR from now on) and it after a long installation time, it came up with everything running.. or walking. UNR 9.10 make it really slow. I tried to remove packages but not luck. The webbook took ages to move around applications or moving the mouse around to launch something. As being so slow wouldn't be of any use for me, I decided to go for Ubuntu 8.04 as this was the release that I found the webbook was first offered. By the way it was sold in the UK by the carphone warehouse as free when subscribing to a 3G plan. Installing Ubuntu/Xubuntu 8.04/8.10/9.04 was simple but with a problem. The screen was dead. Completely blank. The only way to keep using it was connecting an external monitor to the VGA output. Surfing around I found some posts to change the xorg.conf config (will post it later) it didn't not bring life back to the screen. Neither was trying to download the video driver from VIA in Taiwan or upgrading the openchrome ubuntu package of the versions I installed using apt-get. 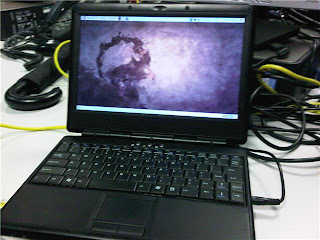 The solution was to download the tar.gz of the latest openchrome driver, compile it and install it manually. a) download xf86-video-openchrome-latest.tar.gz from http://www.openchrome.org/trac/wiki/Installation. i) close your windows. get out of x (Ctrl+Alt+BkSP) and start x again (startx). Or just simple reboot the laptop. The key settings here are PanelSize and ForcePanel to make it work. Below is an picture of the screen working! As always this post is more for me to remember how to fix this in the future. You'll find an empty file (i.e. you're creating it! ), but don't worry, it will still be used by Ubuntu. Only the Section "Device" section is necessary.